San Diego- Sunday, June 26, 2005 Yesterday, Patriarch Dally, the chief of the Chaldean Catholic Church in the world arrived to San Diego coming from Detroit Michigan at 12:00 P.M. At the airport welcomed his coming Fr. 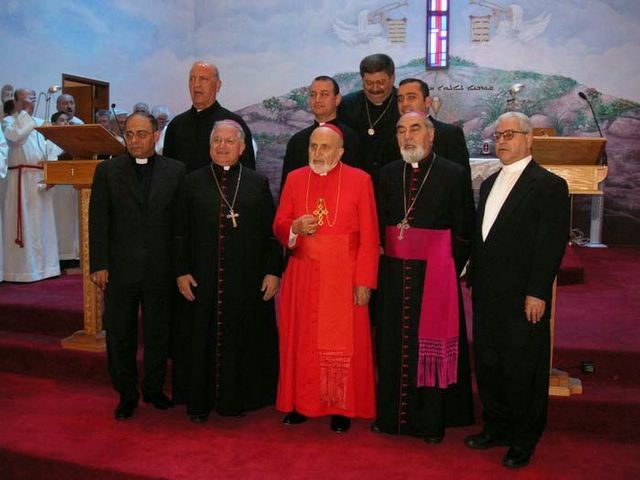 Sabri the Vicar General of St. Peter Catholic Diocese –USA, along with Fr. Felix Shabi the Parochial Vicar in St. Peter’s Cathedral in El Cajon, and Fr. Rayan Atto, a visitor priest who came from Rome for pastoral experience. Number of the parish councils were present at the airport, they received he patriarch with flowers and cheering. At the Cathedral was waiting for the arrival of the Patriarch Fr. Michael Bazzi the pastor of the Cathedral, the subdeacons of the cathedral, along with almost 160 faithful, who they were waiting for these historical unrepeatable moments. The patriarch thanked the Eparchial bishop Mar Sarhad Jammo and Bishop Ibrahim Ibrahim of St. Thomas Chaldean Diocese- USA, all the priests, and the Chaldean people for the nice reception made for him. The Patriarch of Babylon Emmanuel III is staying till july 11 in the us, then he will continue his global visit to Australia then he’ll be back to our home land, to Mesopotamia.